Express yourself in new ways with this highly versatile controller. The Mission Engineering Expressionator is the world's first programmable multi-expression controller. Connect one expression pedal with up to three expression enabled effects and control them individually or simultaneously. Expressionator is a digital device that samples the input from a regular expression pedal, digitally manipulates it, stores it and then converts the signal back to three analog outputs either via digital potentiometer or CV. Unlike an analog splitter, Expressionator stores the pedal the position on each channel, holding an effect in one position, while you switch to another function. For example you could set volume control to 50% and Expressionator will hold it there while you switch your expression pedal away to control wah. When you are done, you can switch back to take over volume control again. Each channel is individually programmable so you can set independent start, stop positions and tapers for each effect. No need to have different expression pedals for different effects. Expressionator can also be set to control multiple devices at once, so you could decrease reverb mix, increase delay repeats, and increase gain at the same time from one pedal. 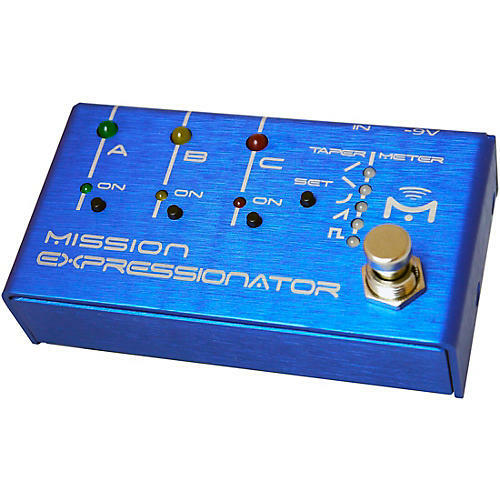 Expressionator is compatible with expression pedal inputs on most stomp boxes, MIDI controllersand multi effects units. 1. Three stomp switch selectable expression outputs. 3. Three color LED channel selection indication. 4. LED pedal position indicator. 5. Internal memory to save presets.